Have a tough lineup decision or simply need a second opinion? We're here for you! Have a tough lineup up decision or need a second opinion? We're here for you! Have a tough start-sit question or simply need a second opinion? We're here for you with our individualized lineup advice! Have a tough start-sit decision or simply need another opinion? We're here for you with another year of individualized lineup advice! DLF is happy to introduce our newest partner, FanDraft.com! We examine a relatively unknown dynasty rookie in 2018. It's a week 17 Free-for-All. 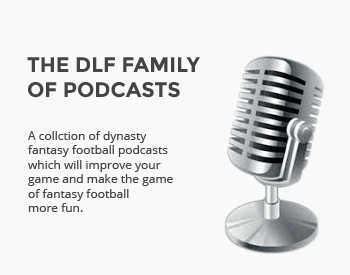 Ask a lineup question, make a random comment or leave a DLF testimonial, it's all good! Championship week! Let's do this!!! Whether for week 16 or prepping for 2018, we've got what you need!